The ‘take a book, leave a book’ nook at the Hive Café was an idea brought forward by a student. The downtown Hive—there’s one at Loyola too—opened its doors in the fall of 2014, in an effort to provide more student-run initiatives, like the book nook, for the Concordia community. “It feels really nice to see more and more of these spaces opening within Concordia that are student-run,” said Jessica Cabana, the Hive Café Mezzanine coordinator. “It’s a different option from the core food monopoly on campus.” She’s referring to the corporate food companies on campus like Concordia’s food provider Aramark, and the recently opened Starbucks café in the basement of the LB building downtown. 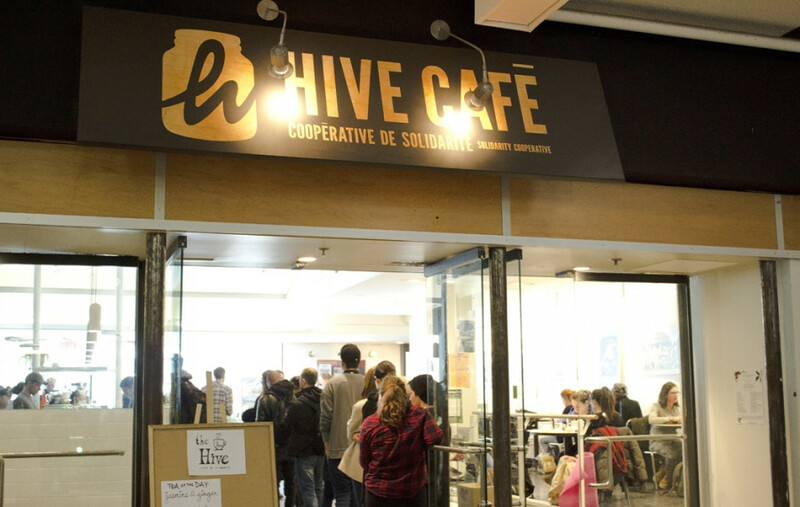 The Hive Café aims to provide a sustainable food model for the Concordia community, said Cabana, who also worked on the project as the VP Sustainability at the Concordia Student Union in 2014-2015. 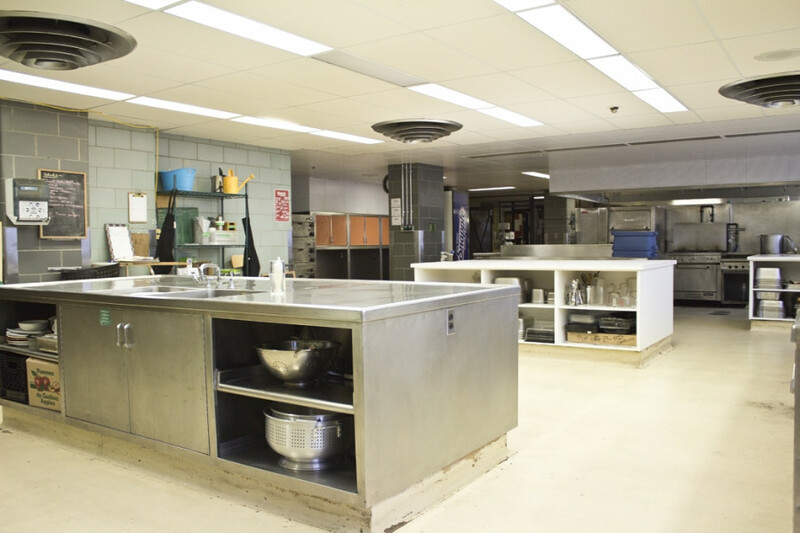 Moving towards this goal, the café’s kitchen moved to the seventh floor of the Hall building, next to People’s Potato, in summer 2015. The space was formerly the cafeteria for first-year residents downtown. By making this move up from the mezzanine, Cabana said employees can prepare more food by themselves. “We moved food production towards in-house cooking, allowing us to have more local food for an affordable price,” Cabana said. Before the move, the Hive was buying food from various catering services. Food prices were higher and the café was unsure of the quality of the food being served, which is an important aspect of its mandate. Now, thanks to the new kitchen space, the Hive produces most of its food, like sandwiches, salads and soups, as well as some baked goods. The average price of sandwiches was reduced by approximately $2, responding to student complaints regarding high prices. The Hive Café now has a direct relationship with its producers, and is conscious about bringing more local and organic food to their menu. According to Cabana, about 70 per cent of the food is local and organic. They also get their sprouts from the Concordia greenhouse. “It’s a balance of what students can afford, to what we can bring in locally and what we can bring in organically,” Cabana said. With approximately 4,400 Hive members, the café is catering to a large student, faculty and staff community. Functioning as a solidarity cooperative, clients of the café can benefit from becoming members by receiving discount prices and taking part in the decision-making process and overall functioning of the café. The membership fee is set at $10, as requested by the government of every solidarity coop, and the Hive subsidizes half of that fee for undergraduate students. As of this year, it subsidizes the whole membership fee for graduate students, who have voted to pay a fee-levy each semester. The money received from memberships must be kept aside for a minimum of two years before the coop can incorporate it into its budget. The Hive monitors all its members through their point of sale system, which tracks each member’s activity at the café, including what they buy and how much they spend. The non-profit coop was initially funded by the CSU’s Student Space, Accessible Education and Legal Contingency Fund, which provided $102,536.79 to fund start-up costs. Two years later, the Hive is still in deficit, but they are right where they’re expected to be, according to Paige Hilderman, the Hive Café Loyola coordinator. Cabana and Hilderman mentioned there is talk among the board to have a vote for a fee-levy for the daily free lunch on the Loyola campus. All of these decisions are passed through the board first and foremost, though. “We’re very consent based,” Hilderman said. The board has three core groups of members—the worker, the user and the support. The user member is the Concordia student or staff that has paid the membership fee. They can then take part in board meetings and bring up concerns and suggestions. The worker members are those who are employed by the Hive Café, and the support members act in partnership with the café. There are two support members that have permanent seats. They are the CSU and the Concordia Food Coalition, who helped co-found the café. This year, the greenhouse is the third support member sitting on board. In recent sessions open to all members, the Hive envisioned six main goals to help the café reach their vision and mission values. These goals are to build a model food system, empower the student community, nurture safer spaces, invest in organizational learning and uphold the solidarity co-op model principles, Cabana said. The Hive hopes to achieve these goals in the first three-to-five years of their opening through different committees. They will solidify the café’s mission, which is to remain an open space for students and student groups to gather. The Hive Café aims to “be somewhere safe for students to enjoy, somewhere where we’re providing real, healthy food,” Hilderman said.